Grains help us save money and eat healthy – but only certain ones. Here is what we eat, why we eat it, and how we get the best price. Grains are the life-blood of most diets around the world, and there are a ton to choose from. As promised, here is your chance to peek into our pantry and see what grains come to our table in a typical week. Some people think grains are fine, and some think they are the source of all disease. But life without grains gets really expensive (trust me, we tried). Our family has decided we are okay with certain ones. If they are problem grains (like white flour) we can get around some of the problems by sources non-GMO varieties or preparing them in ways that make them easier to digest (like sourdough). The grains we avoid, we avoid intentionally. I’ll explain that in a second. Often, we think of grains in terms of the products they are in – bread, granola bars, cereal, etc. – rather than as individual grains – like oats, rice, and wheat. For the sake of simplicity, I’ll list the individual grains and describe the products or dishes in which we use them. If you prefer watching to reading, here’s the video! Both the video and the post have some unique content, but they share the same general information. Oats are cheap, versatile, and naturally gluten-free (which is a thing at our house. Lucky us). Nutritionists, bodybuilders, crunchy foodies, and grandmas alike agree that oatmeal is good for you. If something can bring that diverse party together, I’m in. Because we feed a small army – or at least people who act like one – we buy oats in bulk from Bulk Natural Foods or other bulk co-ops. They source non-GMO and organic products, and their 50-lb. bag of oats is cheaper than any other source we’ve found. Our local Aldi and Costco have the next best prices. Aldi carries the benefit of NOT needing to buy in bulk, while Costco usually carries non-GMO, organic, or certified gluten-free varieties. I use oats for oatmeal (surprise! ), simple granola, baked oatmeal, sneaky-veggie baked oatmeal, toasted oatmeal, high-protein pancakes (no recipe here yet), and I grind it in my Nutribullet or food processor (affiliate links) to make oat flour for gluten-free baking. Not only is rice eaten around the globe, people have eaten rice for thousands of years. It’s super cheap, filling, and gluten-free. There is some debate about the health benefits of white rice versus brown rice. Regardless, I prefer a non-GMO source since we eat it so regularly. At the risk of looking like Doomsday Preppers, we buy it in bulk. It keeps forever if properly stored, and that’s how we buy the best quality rice for the best price. You can find it at Costco or International grocery stores. Like I said, we are gluten-free-ish (heavy on the -ish). However, we have found that we handle wheat okay if it is prepared certain ways. This includes sourdough and recipes that soak the flour overnight. We don’t always soak the flour – I love baking, and we try to enjoy our favorite foods while keeping our health in mind. Of course. Sprouts and Trader Joe’s have good prices for unbleached varieties. We use Bulk Naturals for this as well. Update 2019: Our Walmart started carrying non-GMO unbleached and flour and whole wheat at reasonable prices. We use the unbleached for our sourdough. Here is the part where I put on my nerd glasses and mention I also buy spelt grain from Bulk Naturals. It’s a low-gluten variety of wheat and we use it much like you would use whole wheat flour. It’s very expensive in the grocery stores, but bulk buying comes to the rescue again. We use white flour to supplement our whole grain baking, although we try to stick to recipes that don’t require white flour. Go here for some of our favorite bread and baked good recipes, including the Easiest Homemade Bread Ever, Mookies (trust me), and Garlicky Pizza Crust for 70 Cents! Tortilla chips are kind of a staple here. I know they aren’t the best for you, but we are all about balance. Right now, we’re okay with tortilla chips. However, we try to source non-GMO or organic brands. Aldi has great prices on regular and organic varieties. Trader Joe’s, which supposedly uses all non-GMO products, sells 2-lb. bags for $4. We also buy the bulk organic ones from Costco. In the absence of a microwave, we have an air-popper, and it turns out plain popcorn is extremely inexpensive. Yay! Butter and salt, because of course. We buy this at Walmart or Kroger. While I don’t love beans, they are an essential part of a frugal pantry, and are generally agreed to be healthy food. In our area, Aldi almost always has the best prices for some dry and canned beans, while Kroger and Walmart have greater variety and good prices. Seen the Cheesy Lentil Pie Recipe? It’s frugal, healthy, and awesome. Here are our other go-to bean and legume recipes. Pronounced “KEEN-wah”, plenty has been said about this protein-packed super grain (been on Pinterest lately?). Aldi and Costco are my go-to sources. Gluten-free pasta has come a long way in the last 10 years. It used to be gross and expensive. Now it’s delicious and reasonable. Trader Joe’s has the best price I’ve found – and it’s organic! Packaged snack food is tricky. It’s either dirt cheap and loaded with things that YouTube and food documentaries say will kill you. Or it’s organic, non-GMO, costs as much as a hospital visit and STILL will somehow kill you (YouTube told me). We try to stay balanced and not go crazy in this area. Some crackers, pretzels, and “organic” granola bars from Aldi, but they aren’t a staple in our diet. I also don’t regularly make these myself at home. I’m a person with a life, not a one-woman bakery. We just eat other food instead. In general, when it comes to breads and desserts, we try to stick to homemade. This doesn’t mean we bake all the time. Instead, this rule forces us to decide whether we really want to eat garlic bread with our spaghetti. Baking bread is a lot of work – do we really want to bake bread, or would we rather just eat a salad with pasta tonight? See how it helps us eat healthier? Keep in mind that this is a guideline, not a hard and fast rule. Sometimes, we buy garlic bread. But keeping these guidelines in mind helps us make better choices. We avoid this like the plague. Alright, not quite like the plague. In general, we keep our home mostly free of processed snacks. 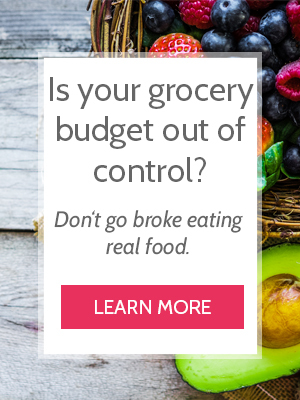 This includes most chips, crackers, cookies, granola bars, and cold cereal. I know that sounds crazy, but it turns out there’s a lot to eat outside of the cereal/cookie/colorful-fish-shaped-cracker box. It takes some adjustment and practice, but eventually it comes naturally. The benefits of eating clean far outweigh the snack-food-high. I like crackers too, but it’s what helps us save money and eat healthier. Again, this is a guideline, not a legalistic rule. Sometimes, we buy crackers. If I’m trying a recipe that calls for a specialty grain product like wild rice, farro, orzo, or barley… I usually try to substitute or skip it completely. I may buy it for very special occasions, but for daily life I stick to our basics because they’re cheap, delicious, and filled with enough variety to keep us happy and interested. Grains are a staple in most diets around the world, and there are a ton to choose from. We eat these ones because they’re frugal, healthy, and delicious (just don’t ask my oldest son about the rice). What grains do you keep at your house? Any you avoid? Share them in the comments! If you found these tips helpful, let us know! Leave a comment, share the post on Facebook or Pinterest, or follow us on Instagram. We also share cheap (like, actually cheap), real food menu plans every month for FREE with everyone who gets the Cheapskate Cooks’ 1-Min Email. Get the next one here. What do you store your huge bulk purchases in? Like the grains from bulk naturals? and where do you keep it? Does it fit in your pantry? Hi Kim! I actually just did an Instagram Live Pantry tour, and you reminded me that I should do a blog post to correspond to that! I do store the grains in my pantry. They are giant frosting tubs from a local chocolate shop, and I just put some bay leaves on the top to ward off critters (which I don’t think there are in my house, but it’s good practice to be safe).